The setting is the very small town of Diessenhofen, located on the River Rhine in northeast Switzerland, as watchmaker Johann A. Hanhart sits down, takes out a pen and paper and drafts an announcement. He "respectfully informs the worthy residents of Diessenhofen and surroundingsâ€ that he has purchased a business and its premises at the townâ€™s Hauptstrasse with the intention of opening a watch shop. The year was 1882 and Hanhart watches were born. Although founded in Switzerland, the company soon relocated their manufacture in 1902 to Schwenningen in southern Germany, which at the time was the stronghold of watchmaking. The sport-loving Willy Hanhart introduced the worldâ€™s first reasonably priced mechanical stopwatch in 1924. He had participated in a track and field sports meeting in the previous year, for which the organizers had great difficulty in finding even four stopwatches of varying quality. These timepieces came exclusively from Switzerland at that time and were only available at exorbitant prices, if at all, since essentially individual watches were produced to order. The young Hanhart became so irritated that he decided to manufacture stopwatches himself. Together with a master watchmaker, he conceived and designed the first reasonably priced mechanical stopwatch â€" and in doing so he pressed the start button for the company that leads the stopwatch sector to this day with in-house movements. 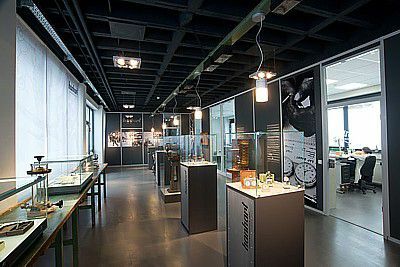 In 1934 Hanhart established production facilities deep in the Black Forest region of Germany in Gutenbach to expand the product range to pocket watches and then to wristwatches. This production facility is still in use today and contains an amazing museum documenting the history of the brand and its products. 1938 marked the start of a new chapter in the history of the company when the first Hanhart chronograph wristwatch model entered series production. 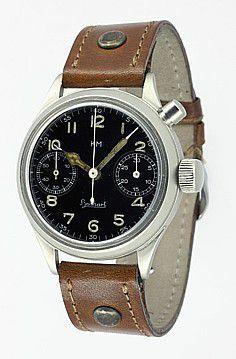 This was the single-button chronograph "Calibre 40", which would soon become established as the companyâ€™s main product with distinctive Hanhart design features that carry forward to today's collection. WatchBuys is very proud to have been selected by Hanhart as their exclusive distributor for North America. This is a German brand with a history of more than 130 years, and touring the production facilities in Gutenbach, Germany convinced us that this is a company committed to producing the finest mechanical wristwatches and stopwatches. To see the complete Hanhart collection, please click here. To view the complete Hanhart watch catalog in English please click here.